I once told my self that I would NEVER get involved with the debate that seems to erupt every time this subject is mentioned. Then why, I hear you asking, are you bothering to write this now? Well, I was recently reading through my e-mails from a finch-based group when someone from the good Olde mother England was seeking advice on how he should go about setting up his fostering program. Lo and behold we had the purist element suggesting he was ‘all wrong’ for fostering and started telling him why fostered birds were ‘no good’. ‘So what’ you might add? Here is a guy that is keen, eager and totally into finch keeping and some Wally is trying to tell him that he has ‘got it wrong’. He is unable to give his birds white ants and had thought out a way of breeding his birds to suit his lifestyle – down here we also have few white ants and I, personally, can relate to his reasoning. But to make matters worse this negative advice was from Australia and from someone living in the white ant capital of OZ, AND with far more hours of daylight to play with! First let me say that I am NOT in favour of fostering for the hell of it or simply as a way to make money. More power to those that do, but it is not my idea of ‘the way to go’. I prefer to parent-rear finches but will foster if necessary. 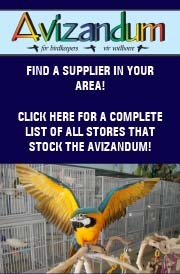 There are a number of species that would have long departed our aviaries if not for fostering at some stage. Our ‘sage’ suggested that fostered birds were useless for breeding and, ultimately, did no good for the species. Obviously our ‘expert’ has never heard of the Green strawberry or the Tanimbar parrotfinch! He then went on to state that fostering was only used for ‘smuggled’ species that were ‘new to Australia’. What can he mean? The main bird that is used for fostering is the Bengalese mannikin. Throughout the world people use this bird to foster their finches – especially the Gouldian finch. But before you race out and purchase 10 pair and start to foster like crazy be aware that the really successful fosterers have spent considerable time and energy developing a STRAIN of manikins that will be good fosters. One breeder I was lucky enough to visit stated that you only needed 2 Bengalese in a cage to rear other chicks. Two males, two females or a pair were equally useful as foster parents! True. We saw the evidence for this in his parrotfinch breeding rooms. His plan was to allow his parrotfinches 2 nests, which he fostered, then they would be allowed to raise the third clutch by themselves. After this third clutch they were rested. His results were unbelievable. The descendants of these birds are now happily producing young in aviaries the length of Australia – so much for their being useless!! The other major success story here is with the Green strawberry finch. A few years back they had almost disappeared. That is until a dedicated breeder got hold of a pair that had a known history of flinging their chicks on the floor. This pair had ‘done the rounds’ but their new owner was determined. He placed every nest that they had for the season under Orange-breasted waxbills and reared about 16 young. These young were placed back with their biological parents as quickly as they were independent of their foster parents. The following season these birds formed the nucleus of his breeding program. Lo and behold they raised their own chicks on the livefood that they were raised on the previous year. He is a bit hazy (modest) about how many he bred the season after but it must have been over 76!! If he’d listened to our ‘sage’ maybe there would be no green strawberries left here today. He has never felt the need to foster these birds since that initial season. This tends to paint a pretty rosy picture, but I have no doubt that some fostered birds are useless for breeding. 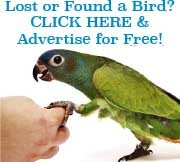 However, this is usually the fault of the person doing the fostering not the bird itself. So, how do we get started? First identify your problem. Let’s use this scenario. You have just purchased a pair of insectivorous finches from the mainland that you know were raised on termites. You decide to put them in an aviary by themselves so you can give them extra livefood. They go to nest. A few weeks later you notice several black bodies on the floor and the livefood bowl is still full. After you cease swearing at them you decide to foster. What to do? 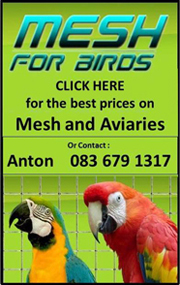 You could ring around and try to buy a pair of Bengalese that are from a fostering strain or you could look for a similar species to the one you want to foster that you KNOW will rear their own young in YOUR aviaries. In my case it was the Red-cheeked cordon bleu. The scenario I outlined was for the Blue-capped waxbill. Now, do I just start swapping eggs willy-nilly or should I do something else? Here is why it is important to bombard experienced aviculturists with 4000 questions whenever you have the opportunity! I asked a friend what his secrets were to successfully fostering finches. His answer was to take your potential fosters from birds that have NEVER been allowed to raise their own young. His logic was that if they have never seen what their own chicks look like how will they know that the chicks that you want them to hatch aren’t their own? As a biologist I had problems with this statement but I shut up and listened. Ok, let us see if he is correct. I look my foster parent cordons from young that I knew had never bred and to my amazement they were exceptional parents – they actually raised 100% of the Blue-caps that they hatched. My results from randomly selected Cordons (ones that had raised their own young previously) were good too – but not 100%. The Orange-breast waxbill also appears to be a good foster parent and we have used these to rear Yellow-wing Pytillas with no problem. The Cordon is also not averse to rearing birds that are not closely related. A friend recently gave 3 Melba eggs to a Cordon and they raised 2 young. The interesting aspect of this was that when the Melbas left the nest their ‘true’ parents then took over the task of rearing them and would not let the cordons near them! And we think we know a lot about bird behaviour. DIET: Another key factor is to ensure that the foster parents will feed their young on a diet that closely resembles what the fostered species would get from their natural parents. I guess that means that you would have to get your fosters onto a higher protein diet in order to rear insectivorous species. This too is easier said than done with some species. I have used the humble Zebra finch to rear the non-livefood requiring species on several occasions but have not had this success with more insectivorous species. They will feed them OK but with seed and not with live food or supplements. In an article I wrote a while back I recorded the difference in crop material that were observed in a pair of Blue-caps that reared Cordons (don’t ask it’s a long story!!). The crops of these chicks were filled with a ‘milky’ substance comprised of a great deal of live food. However, the Zebras tended to just fill them up with seed. From this you can probably gather that you are going to spend a great deal of time and effort in just selecting your fosters before you even get to the actual fostering. Well, that gives you some ideas on the evils and potential benefits of fostering. No doubt the skeptics are horrified but some of you might find some salient points within. So let’s try to put down some important points to finish with. 1. Make sure your fosters are from an established strain that have a proven ability to foster other species. 2. If cage breeding make sure your fosters are ‘bomb proof’ and will not leave chicks when you touch the cage. 3. If fostering with a related species in an aviary situation make sure that when you change the eggs over the potential foster does not actually see you change over the eggs. 4. Don’t look upon your foster as ‘just a Manikin or just a Zebra’. Treat them as if they ARE a pair of Violet-ears or Tanimbars. 5. Diet is the key to good fostering so ensure that you research what the parents would be feeding their own chicks so that you can replicate this in the foster parents. 6. 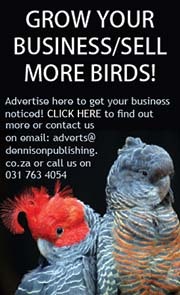 If using related species in an aviary situation as fosters try to select your fosters from young birds. 7. When your fostered chicks are on the perch make sure you put them back with their own species as soon as is possible to avoid any imprinting. That’s about it folks. Take the advice of those people that tell you fostering is wrong with a grain of salt and do what you feel is right for you. We can’t all have access to copious amounts of live food in the form of termites or have those extra hours of daylight in the winter so why should that prevent us from keeping some of the more exotic insectivorous species? Use fostering as a way of building up your own stock raised on your own live food and if they STILL tell you you’re wrong tell them to remember the Green strawberry! !